In June 1964, Dearborn Steel Tubing, Ford's prototype/concept car show supplier, received a 1963 Ford Mustang Allen Point Pilot Point pre-production chasis, the ninth Mustang ever built. 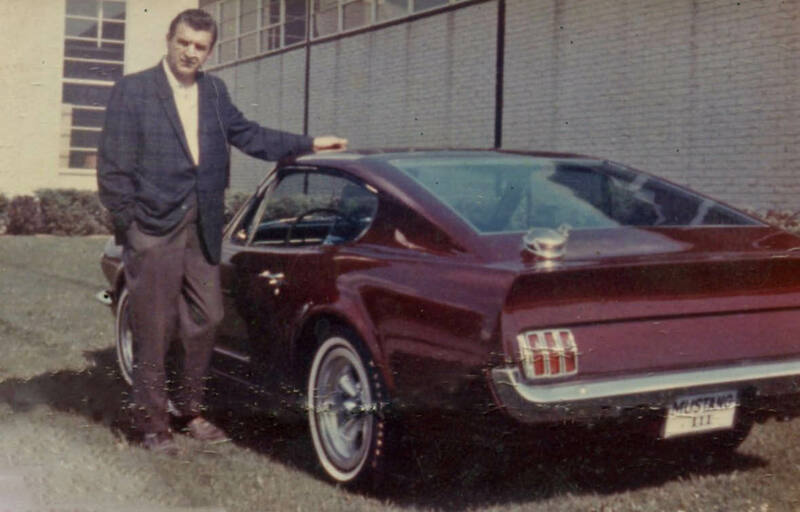 According to Dearborn's records, "the Fastback 'Shortie' Experimental Mustang was built at the request of Ford Motor Company for showing in its Custom Car Caravan ." 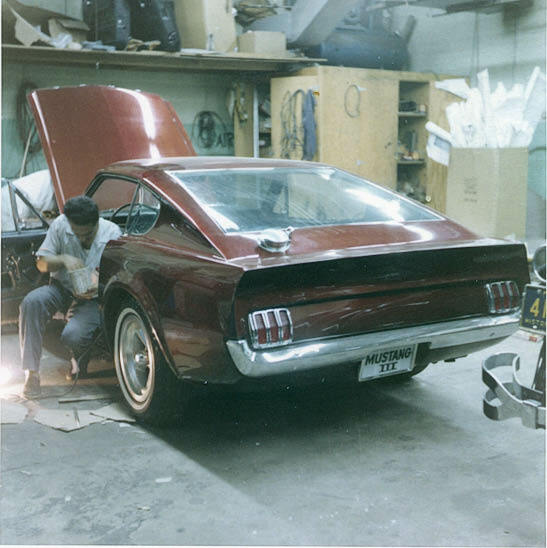 In July 1964, Paul Shedlik documented the creation of this unique Mustang before he painted it "candy apple red". What is the most signifcant feature in this previously never before published photo? 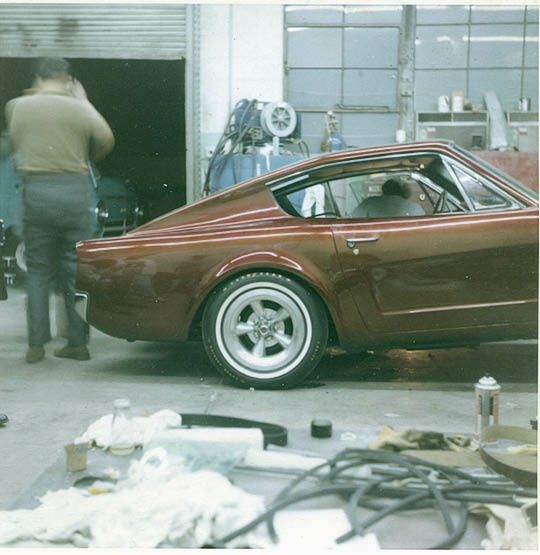 These are the first photos to show the "Mustang III" brand name on the automobile. Earlier photos of the automobile in 1964 and 1965 never revealed the license plate. What other significant automobiles were created by Dearborn Steel Tubing? In May 1963, Ford sent design specifications for the Mustang II to their prototype/show car supplier Dearborn Steel Tubing. 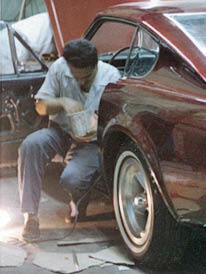 Who is seen working on the Mustang? Provide some details of his career. Vincent Gardner, a designer and stylist for Dearborn Steel Tubing from 1963 to 1964. A profile of Vincent Gardner as posted on the Pack Automotive Museum website. A profile of Vince Garnder on the Kustomrama website. 1936 Cord 810- as a 22-year old, Gardner prpeared the clay models for Gordon Miller Buehrig's design team. 1963 Mustang II Vince Gardner was given responsibility for buidling the prototype. 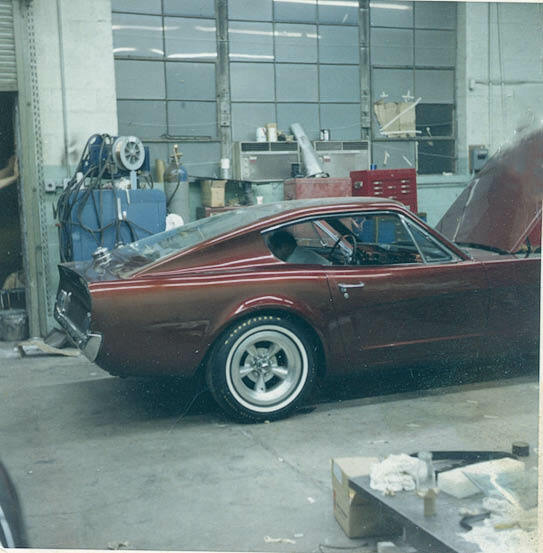 Congrats to Art Kleiner for his correct answers to the builder and designer of the Mustang III. Kudos to Paul Shedlik for providing these rare Dearborn Steel Tubing photos! Come support the Landmarking of the Old Courthouse Road Motor Parkway Bridge at 7:00 PM tonight in Manhasset. This "Mustang III" license plate had previously never been seen in a published photo. Look closely: Designer Vincent Gardner was working on the car in each of these photos. Vince Gardner and another view of the "Mustang III" license plate. 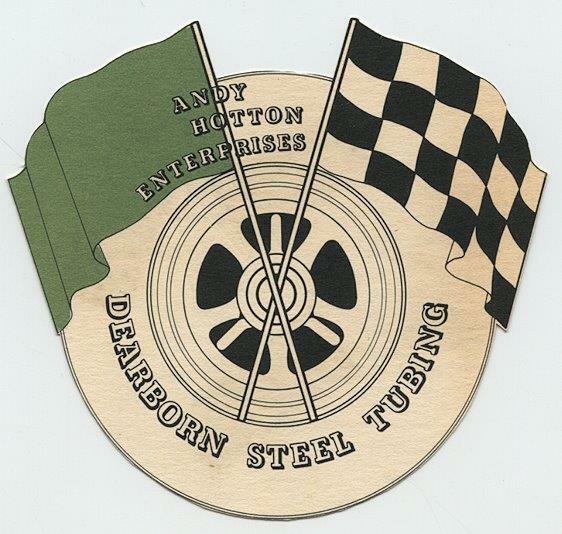 The Dearborn Steel Tubing logo used in 1964 as provided by Paul Shedlik. What is the most significant feature in this previously never before published photo? How about the placement of the gas tank lid? Or it being a two seater, shortened base, 3 carboretor, fiber glass creation. Thunderbolt, Ford Falcon 427 A/Fx dragster, F-100 XL Pickp-ups and a 1962 Town Car limo for the white house (for JFK?). Vincent E. Gardner - if so then here are some highlights -started in the auto industry with the Auburn Auto Company, worked for Studebaker, worked for the Dearborn Steel Tubing company in the 60s where he designed the Mustang III, claimed it had been stolen when he actually hid it away after Ford decided to end it.